Reed Bowman is the Research Program Director for Avian Ecology at Archbold Biological Station. 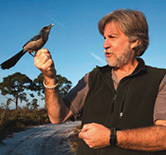 Over the last 25 years he has studied the behavioral ecology, population biology, and conservation of several threatened and endangered birds, including the White-crowned Pigeon, the Red-cockaded Woodpecker, and the Florida Scrub-Jay. One of his primary interests is the many affects, both locally and worldwide, of increasing urbanization on birds, focusing on understanding many of these anthropogenic ecological changes and their impact on birds at a variety of scales, from physiological and behavioral responses to population and community responses. His lab uses a combination of longitudinal, observational studies and controlled experiments to identify how genetic, phenotypic and environmental parameters shape fitness landscapes over space and time. He is an author on more than 80 scientific papers and book chapters, co-editor of two books, and co-author of one book, “Florida Bird Species”.